Why we dare to say that our products are better than others? MICTUNING always focus on selling superior products and providing the best customer services. 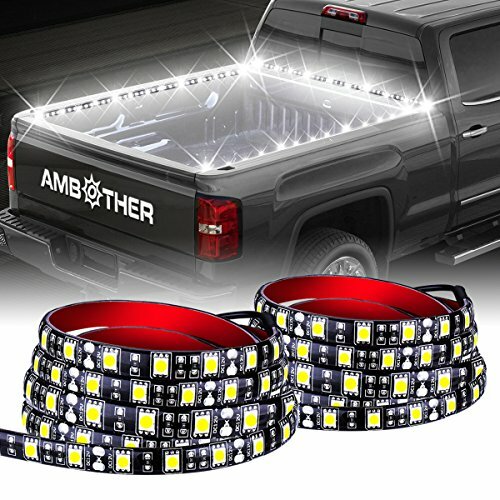 These light strips are made of top led chipsets with IP67 waterproof hosing, giving them excellent protection against strong wind, rain drops, dirt, sand or even snow, super durable up to 30,000hrs running time. As special bonuses, we deliver you a free 2-way splitter cable and extra ties that other sellers do not have. 2pcs White 60" LED lights, long enough for Pickup/Truck/RV Awning/SUV/Cargo/Camper lighting or home party decoration. The lights can be side mounted on anywhere that has 12V power source, and the 3M adhesive and extra ties help to fix the strips. Coming with on/off button and blade fuse, allows you to easily control the lights and keep your car running safely! Please feel free to contact us for help if you have any question and your FIVE STAR rating is the biggest motivation of our best services! Unparalleled Brightness: Abandoning the traditional straw hat technology and adopting the latest SMD LED technology. We used 180 5050SMD LED lamp beads, and the brightness of the product has more than doubled, which can brighten your car without any dark spots. Extreme Waterproof Performance: Different from other ordinary lighting soft light strips, we have added waterproof silicone to the product, which is enough to meet the international IP67 waterproof standard. It can withstand the severe rainstorm and never need to worry about any waterproof problem. Safety Measures: We are equipped with switches and fuses, and have passed the international certification CE ROHS FCC DOT certification, AMBOTHER Bed lights for truck can make you worry-free driving. NO-Drill Installation: It comes with a tough-as-nails adhesive enhancer that increaseshold strength over 6x.Reliable adhesive can be easily peeled off in a few seconds on any smooth surface. No need to drill, it ain't going anywhere ! Widely Used: working voltage: DC12V.best for RV Awning Light, Truck Bed Light, Step Bar LED Lighting, Side Door Led Lamp, Pickup Bed Light Kit, etc. This product has a one-year after-sales warranty service, if there is any problem, please Contact us in the first time! If you have any questions about this product by AMBOTHER, contact us by completing and submitting the form below. If you are looking for a specif part number, please include it with your message.